The article lists a number of his credits which indicates he had a long and varied career. It also notes, "He spent a semester at the University of Cincinnati but during World War II he dropped out to enlist in the Marine Corps — where his father had been an officer. At 17 he became the youngest Marine drill instructor, according to the TCM website." I hate to see all my childhood heroes passing over to the other side. 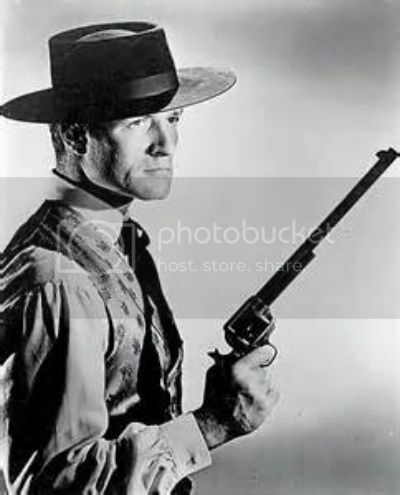 A pic is in order for Hugh O'Brian. Here's the gun I always associate with O'Brians version of Wyatt Earp. I really didn't watch this show but I always figured that by the time he got that cannon out of his holster the bad guy would be long gone or would have shot him a dozen times or so. Yes, at one point in his life Wyatt was a deputy sheriff but in Tombstone, where the show was set, he was Marshal Wyatt Earp (and even that was not historically accurate).